It is no news the current economic recession is biting hard on everyone. 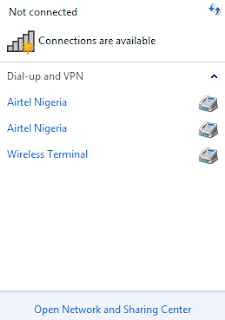 I am sharing this piece to save you the extra cost of purchasing a modem for your laptop when you have an android phone you can actually connect to. I have been enjoying this for a long time now and I think its important I share it with everyone out there. Now follow me carefully as I lead you through this easy process. Firstly, go to settings on your android device. Now you would see different options, Wifi Hotspot, USB tethering, Bluetooth tethering. Next, you click wifi hotspot and then tick ON. We are set with your android device and almost good to go. Do remember to put ON your phone’s data connection. Secondly, I believe your laptop or desktop should be powered ON already. Now go to connections on your PC and click the search icon located at the top right corner. After searching you should see your android device’s name. Click on your device’s name and then click on connect. It should automatically connect if your device has no password. But if there is password, it should prompt you to input your device’s wifi-hotspot password. Now you can enjoy seamless browsing with your PC from your phone’s mobile data. Also, you can browse over BLUETOOTH connection between two android devices with these little tech tips am going to share with you right now. Now go to your android device with the mobile data bundle. Click on settings and navigate to tethering and portable hotspot. Now click on Bluetooth tethering. Your device is ready and set to give out data. Switch ON your Bluetooth and search for the other device name. When you find the device, click on it and click browse with Bluetooth.